Etsy | Stitch, Brinn, Stitch! 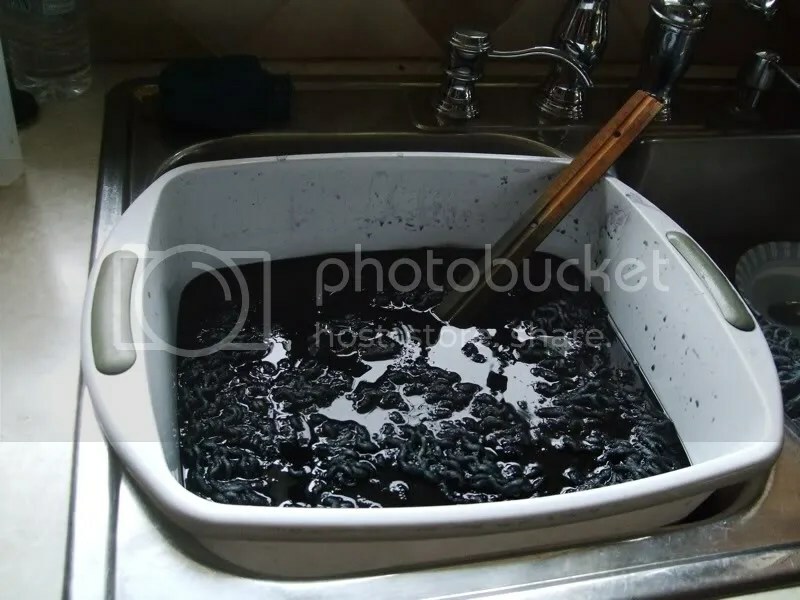 Hey, so remember when I had that blog and I updated it and told everyone about the stuff I was making? And then I apparently fell of a cliff and never got around to posting for like a month? Yeah. So hi. It’s my birthday today (I’m 23), so I guess you guys get the gift of a post today. I don’t know. Anyway. I’ve been hella busy recently. I went up to visit the boyfriend’s paternal folks for Thanksgiving and as such spent several days in New York City. There are no pictures, but we played a lot of Scrabble and other tabletop games and also there was food or whatever. Every side of the boyfriend’s family is awesome and it’s totally not fair. Yarn: Cotton/acrylic blend. Broke my sweater fast for the yarn. 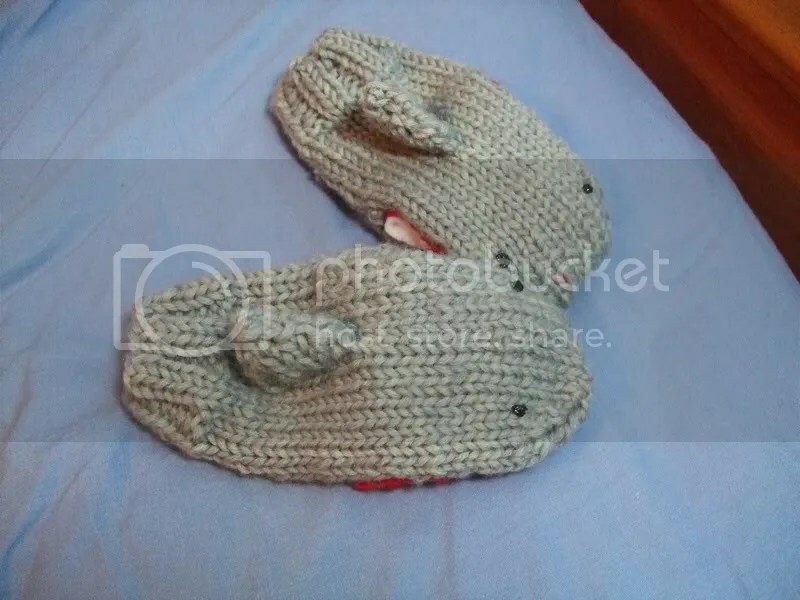 So now that I’ve actually made the Steggie mittens, I’m going to update the Jurassic Mittens pattern with more pictures and fix everything up and what all. There’s no pattern cause I made it up as I went along, but I’m pretty pleased with how it came out. 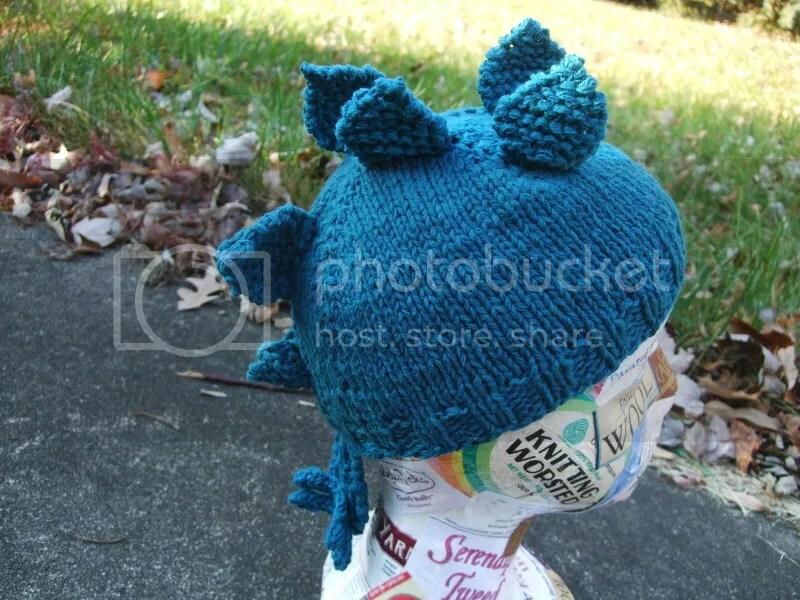 The boyfriend reminded me about the little spikes at the end of a Steg’s tail, so I included them on the hat. Perhaps I’ll write it up. I haven’t done any pattern writing in a while. I’ll try to get back on the posting ball, but I’m mostly just making sharks here. And I rarely photograph them before I send them out. Plus I’m going down to Virginia Beach on the 19th and spending Christmas in Florida, so I’ll be busy. But I’ll try. In book news: Joe and I read Outgoing Flight, which was AHH AMAZING and I totally worship at the church of Timothy Zahn. I’m currently reading Spinneret, a book of his I bought on Amazon’s black Friday sale. ALSO did you know that there are Stargate Atlantis books that follow the show cancellation? OF COURSE I bought those suckers. I finished the first one. For more book news, you can follow me on Goodreads here. 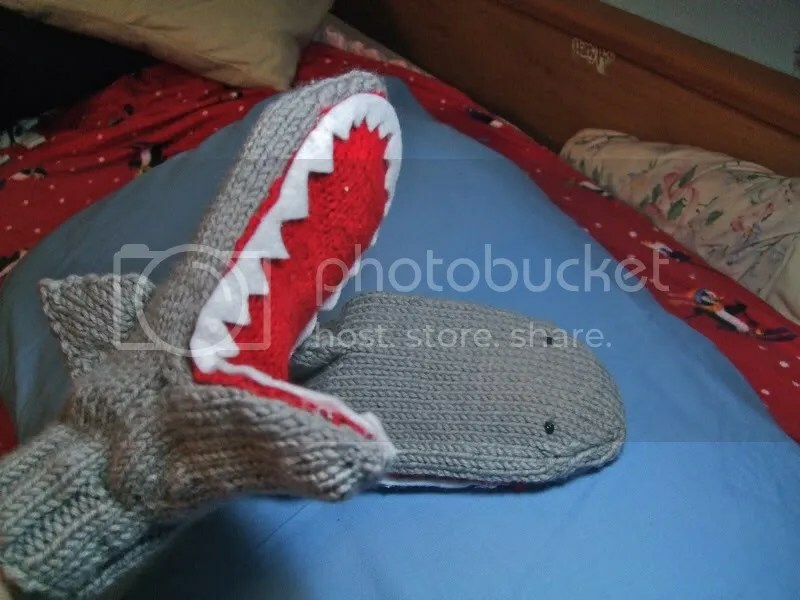 THIS IS THE LAST PAIR OF SHARK MITTENS FOR THIS SEASON. I AM SO EXCITED. I GET TO KNIT THINGS FOR ME NOW. Except not really because I am knitting a mohair wrap sweater for a swap. But more on that later. Anyway. Sharks. They’re done. 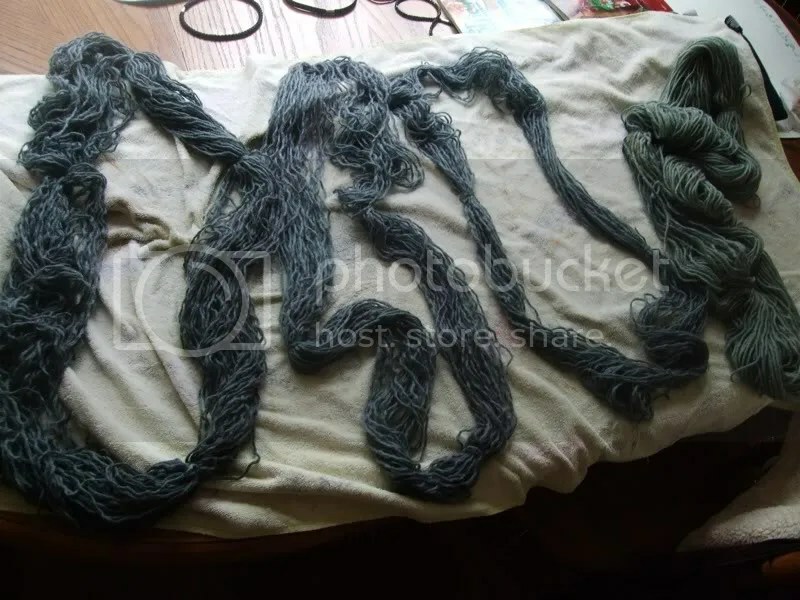 These ones are knit in Feza Yarns Zarone, which I dyed with RIT dye to get black. The red is from a GIGANTIC recycled JCrew sweater. I have never been more excited to be done with a series of things. OMG. Anyway, yeah. More on the sweater later. I recently finished another non-shark FO! It was a commission, and it went faster than I thought it would. Mods: Made it a bit smaller around and the gauge is different. I’m pretty pleased with how it came out and I was glad to make something other than mittens. 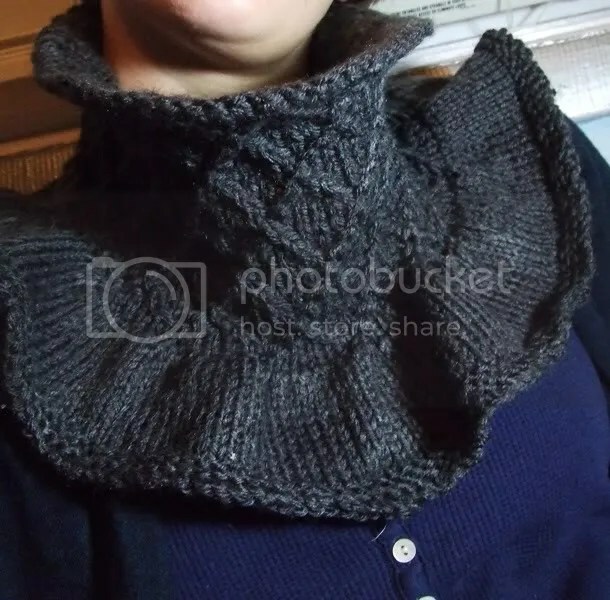 I might make a similar one in wool for myself. 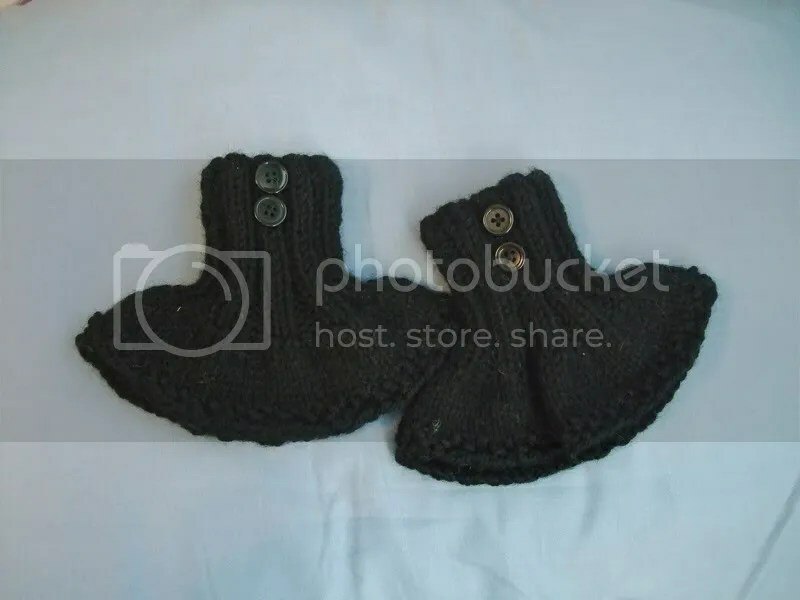 I am currently working on mittens, being exhausted from my actual job, and packing (sort of) for my holiday trip to Florida to visit my grandparents. During which I’ll likely be knitting all the things. This post would have been more involved, but I’m exhausted, so there’s that. So yeah. News first! After weeks of staring at the WP ad above my dashboard, I finally caved and purchased my very own domain name! I am now located at stitchbrinnstitch.com (though it might take a day or so to load), though you can still find me at the WordPress link. Yay! Now it’ll be much easier to pass out my website. Now a finished thing that isn’t sharks or spats! 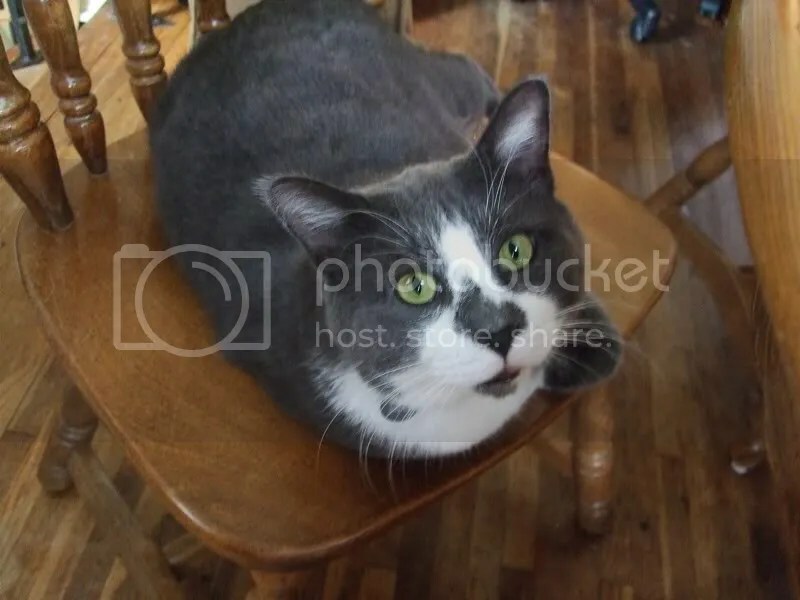 It is, however, mittens. Yarn: Brown Sheep Lamb’s Pride in Kiwi and some recycled sweater yarn for the mouth. Mods: None, they’re my damn pattern. 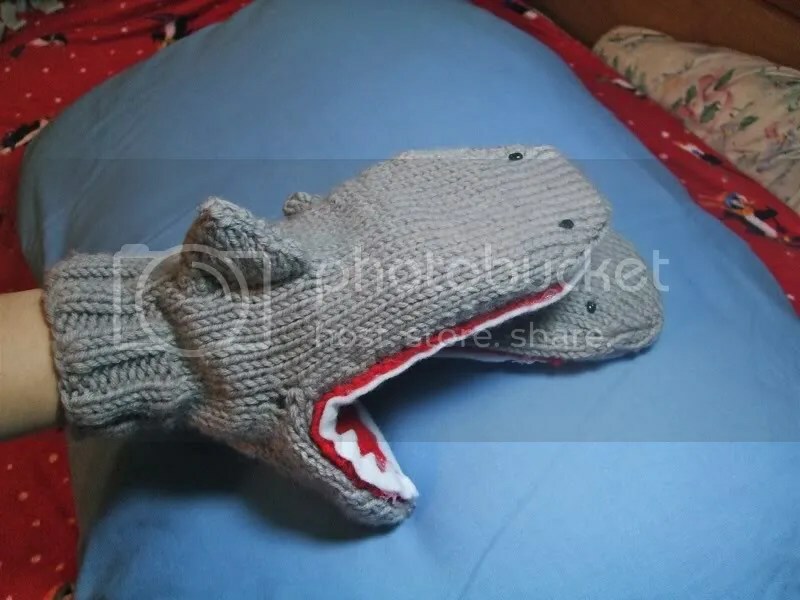 The dinos were a nice change from the sharks I’ve been knitting as of late. 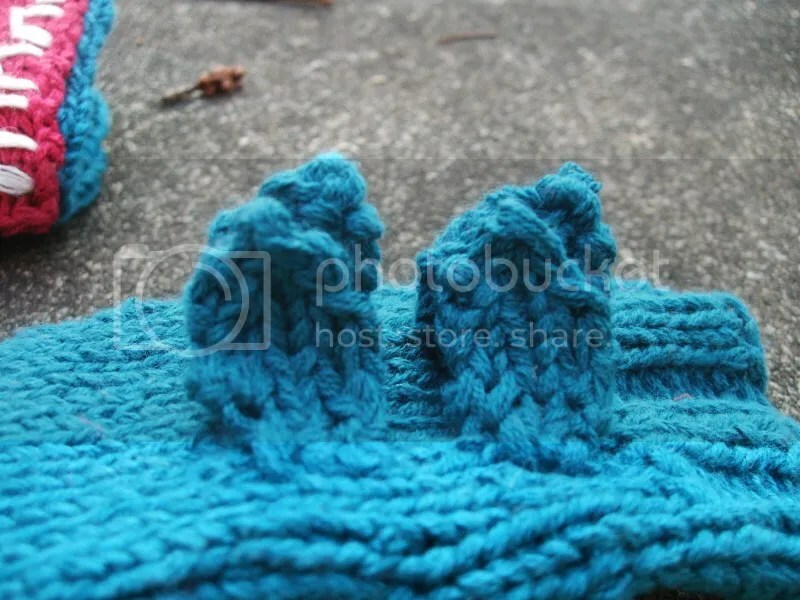 I love Lamb’s Pride (it’s squooshy and soft) and I ought to get some for myself (not that I need any more yarn). On my plate at the moment, I have another pair of dinos and two pairs of sharks. And then there’s that mohair pullover. And all the things I want to make for me. Later this week I’ll have another non-shark FO, so you can look forward to that. 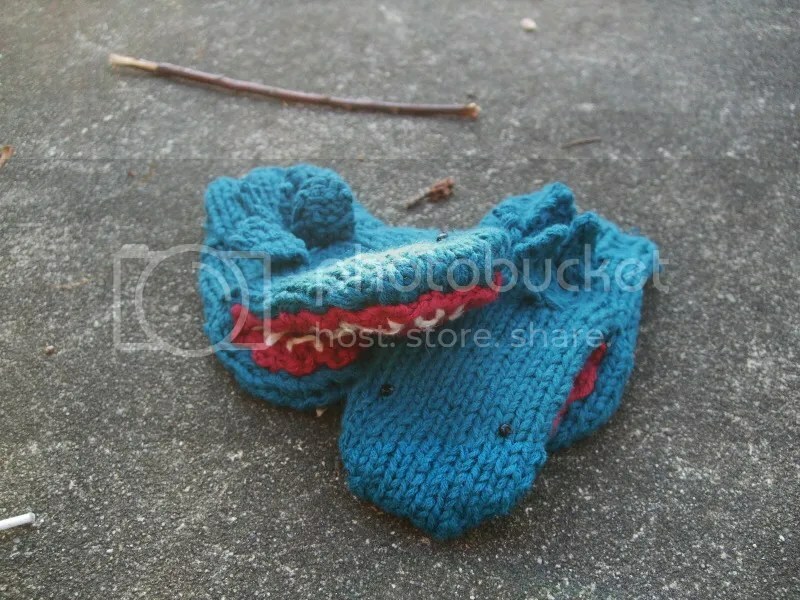 Good luck to people knitting for Christmas. 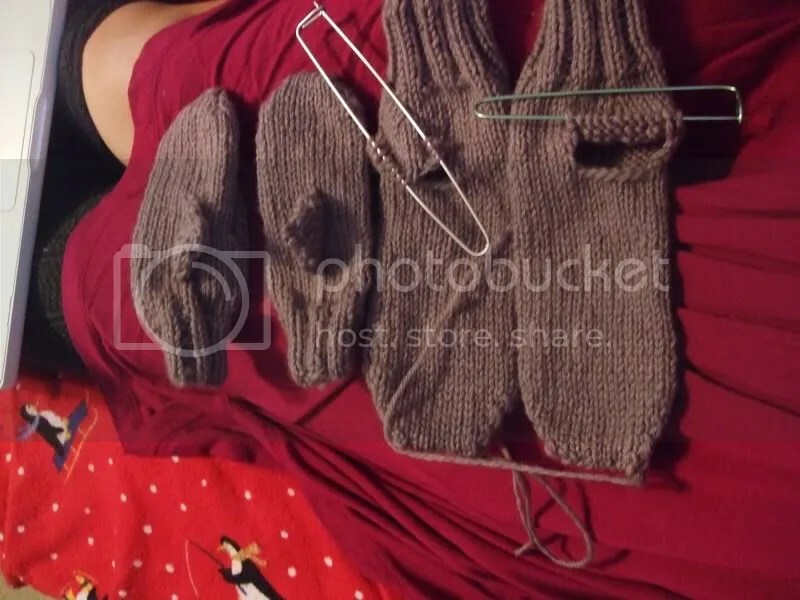 I’m not knitting for anyone this year, even my completely knit-worthy boyfriend. I bought his birthday present this year (albeit a couple weeks late since we’re celebrating in January). I’ll probably knit it next year, but this year I simply didn’t have the time between my Etsy store and my actual real job (which is completely awesome. I love teaching). They’re a bit further along than that now. 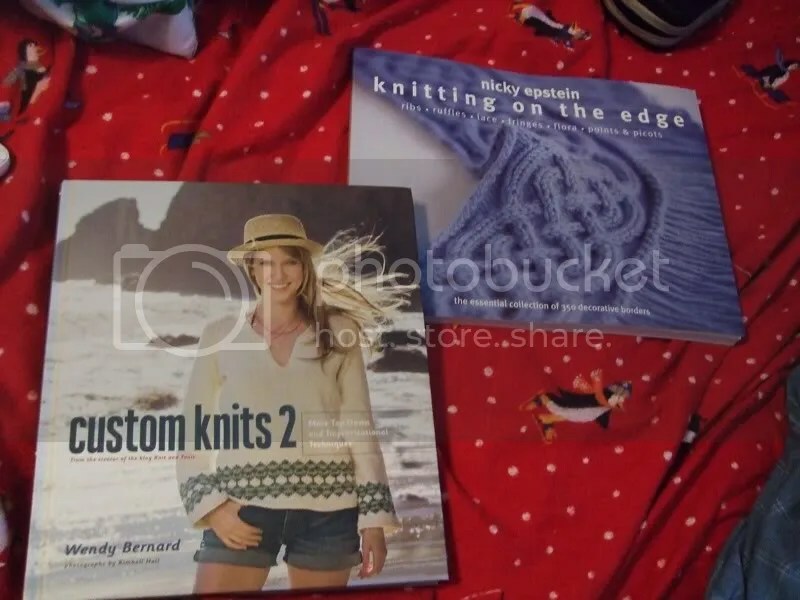 Knitting on the Edge, which I’ve checked out from the library a ton and have been coveting forever, and Custom Knits 2. 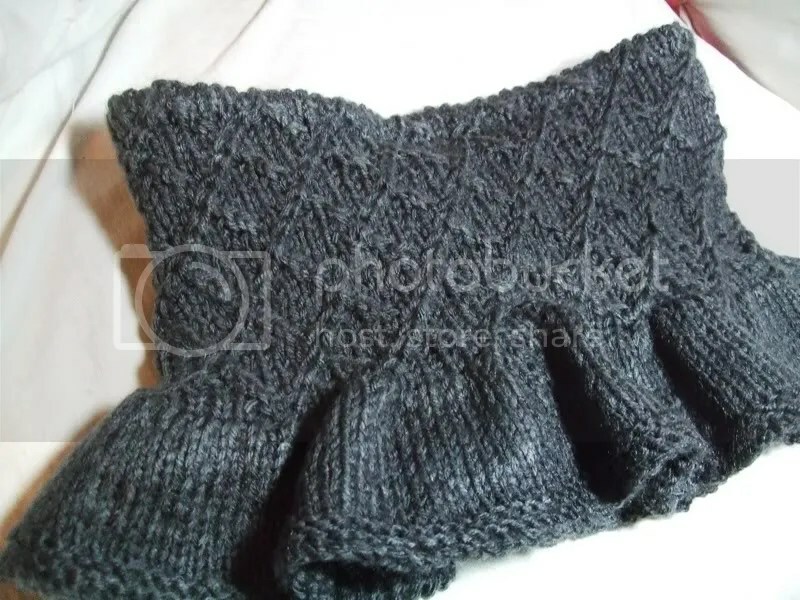 I have the first Custom Knits book, so between the two, I have no excuse for making a poorly-fitted sweater. And I’ve got plans for sweaters. Oh, do I have plans. But more on that later. For now: sharks. So I finished some things today for Etsy and got them in the mail. And I remembered to take pictures! Well, 2/3 anyway. 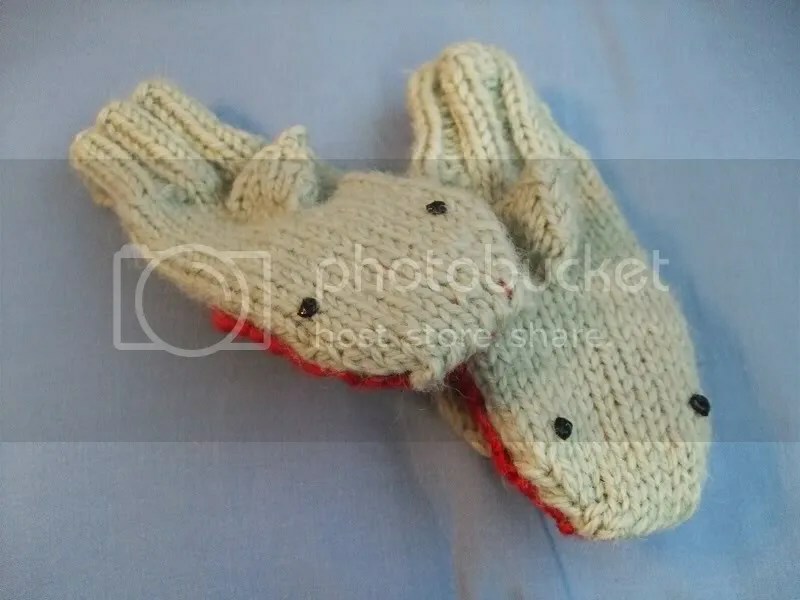 A pair of baby sharks, going to Canada. 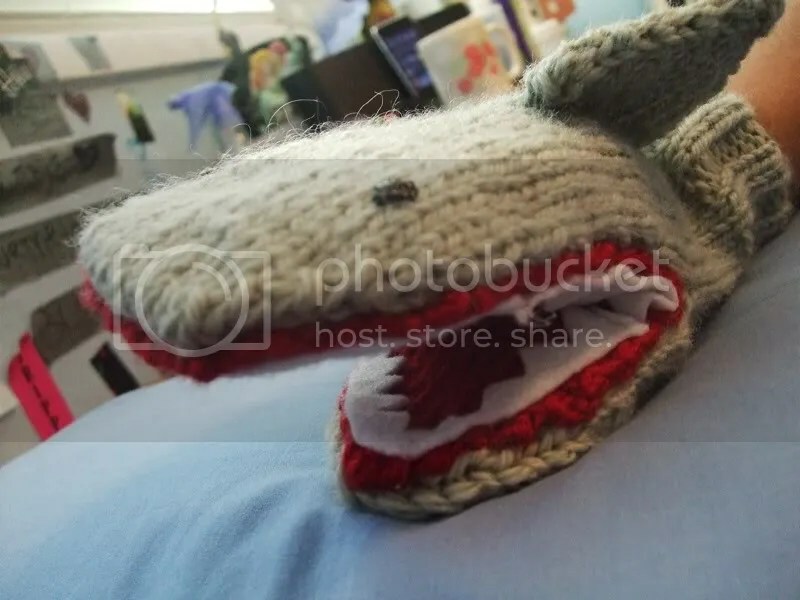 A single shark to be used as a puppet. And some black spats. 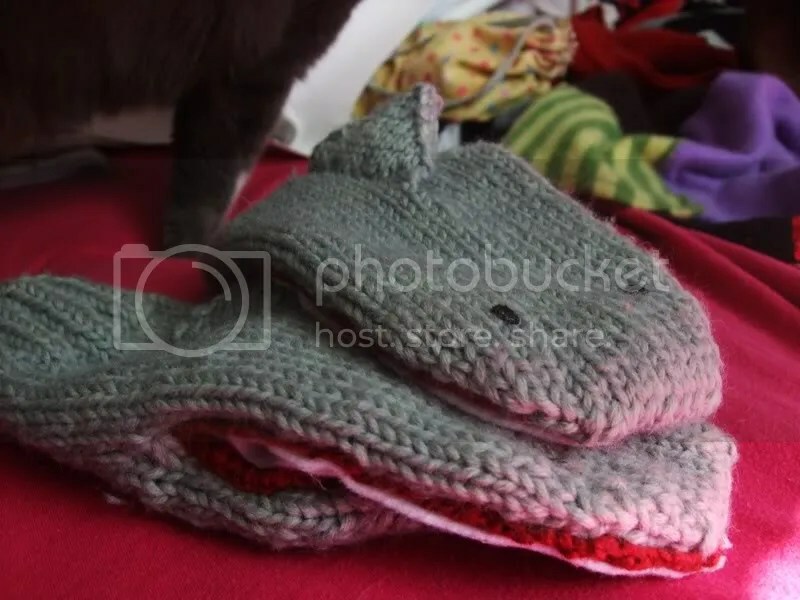 I’ll be mailing everything off tomorrow, and I just got two more orders for spats and an order for shark mittens. So get used to seeing those things for the time being. 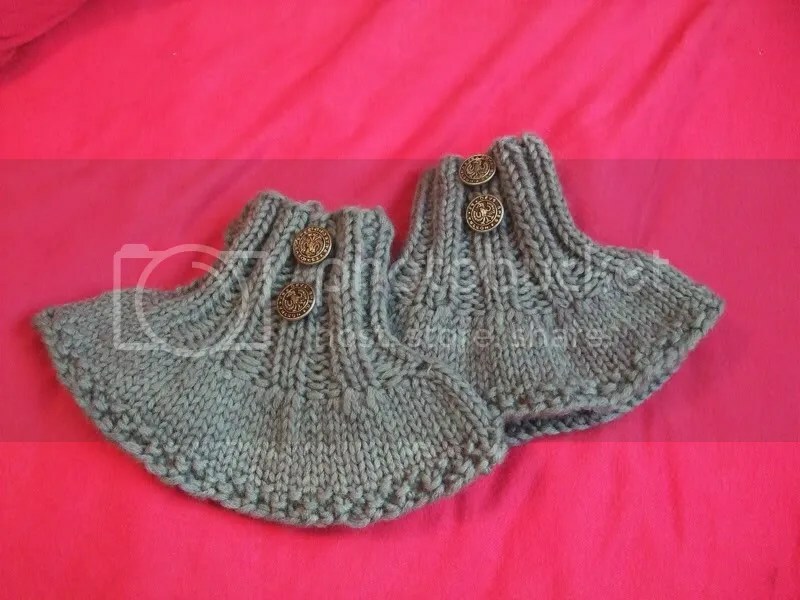 Sooo the other day I participated in a test knit on Ravelry for a pair of cute slippers. The pattern hasn’t been released yet, but I’ll edit this post with a link when it has. 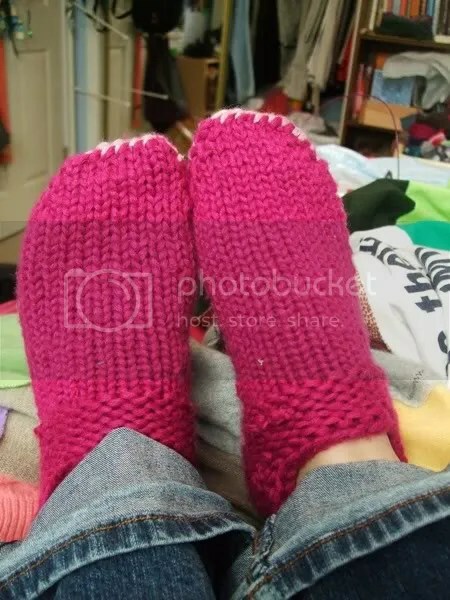 Mods: Fewer heel stitches, blanket stitched the heel. This was a pretty solid pattern, and it knit up reeeeeally quickly. 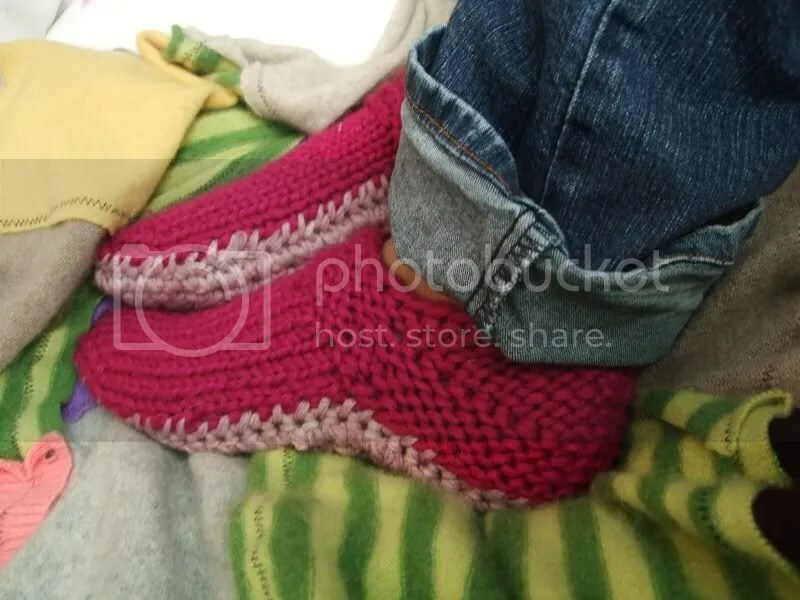 It was sort of annoying to knit the upper and sole as separate pieces and sew them, but I like the two color effect. And also they’re super comfy. 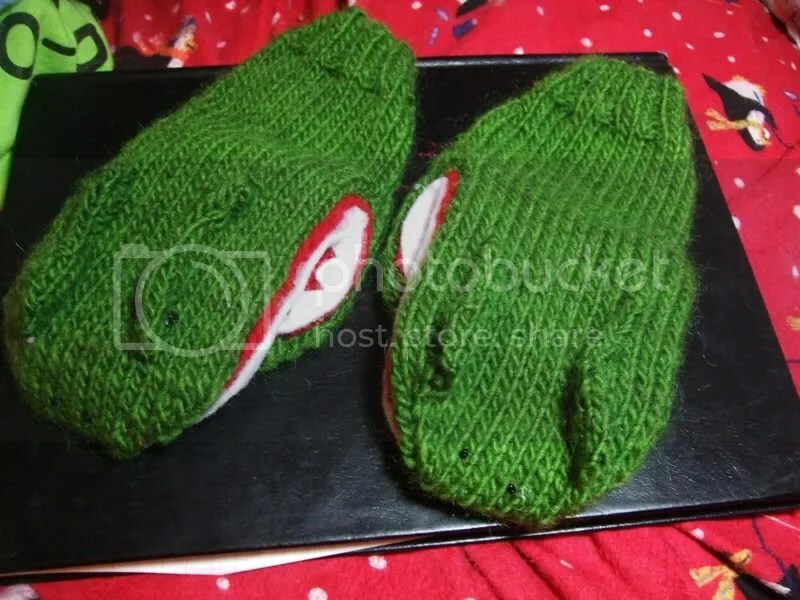 There’s not a tremendous amount of things to say about these slippers, so instead I’ll tell you about some WIPs. 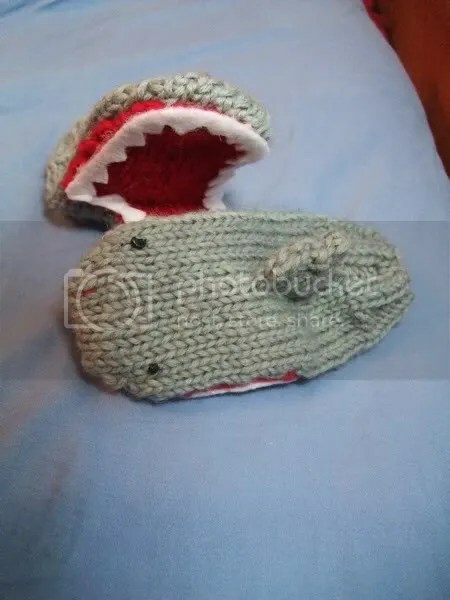 I’m currently working on some baby shark mittens (they’re so wee! 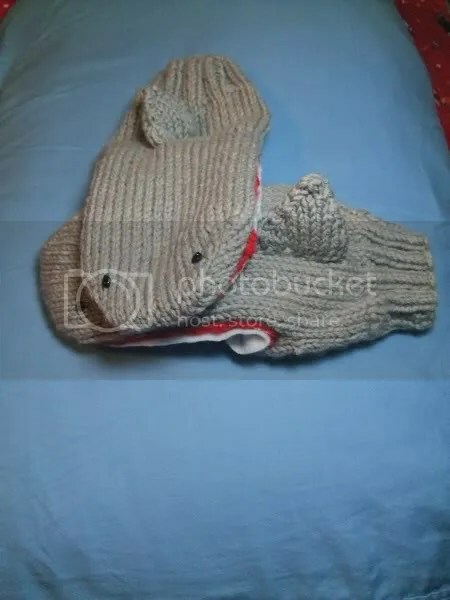 ), a pair of black spats, and a single shark mitten to be used as a puppet. I’m nearly finished with the first two so they’ll probably go in the mail tomorrow. 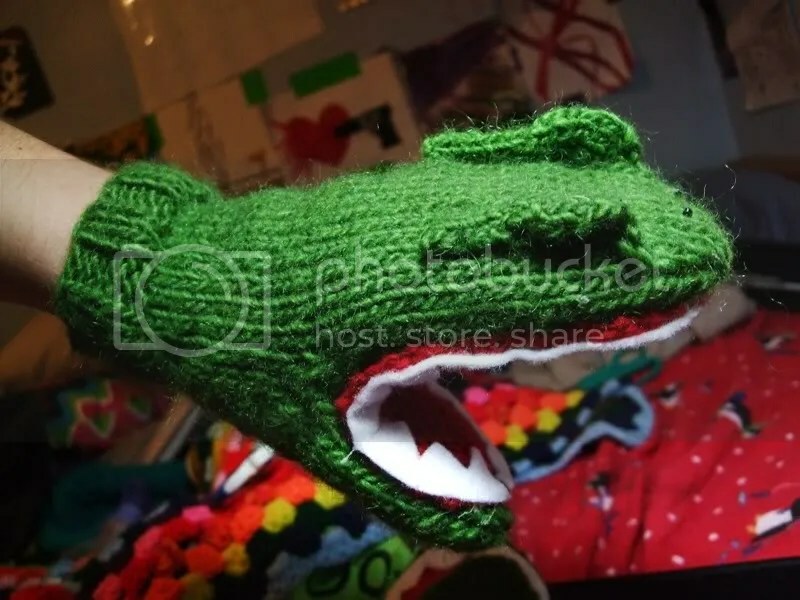 I’m thinking about adding custom knit dinosaur mittens to my Etsy shop, but people so rarely give me their hand length (it’s in caps in the description) that I doubt they would specify their dinosaurs. Maybe I’ll just say if you don’t tell me, I’ll do what I like.